It’s the end of our spring break here and we had big ambitions to go on a fly-by-the-seat-of-our-pants trip to the Grand Canyon last weekend with two other couple friends. But, as the date approached life happened as it does and nobody planned, so we ended up calling the whole thing off. Instead, we opted for a casual brunch at our flat last Saturday morning. Honestly, it was perfect: Relaxing, delicious, connecting – just what we all needed. The Grand Canyon will have to wait for another day, and that’s OK with me. Sometimes brunch trumps road trips. 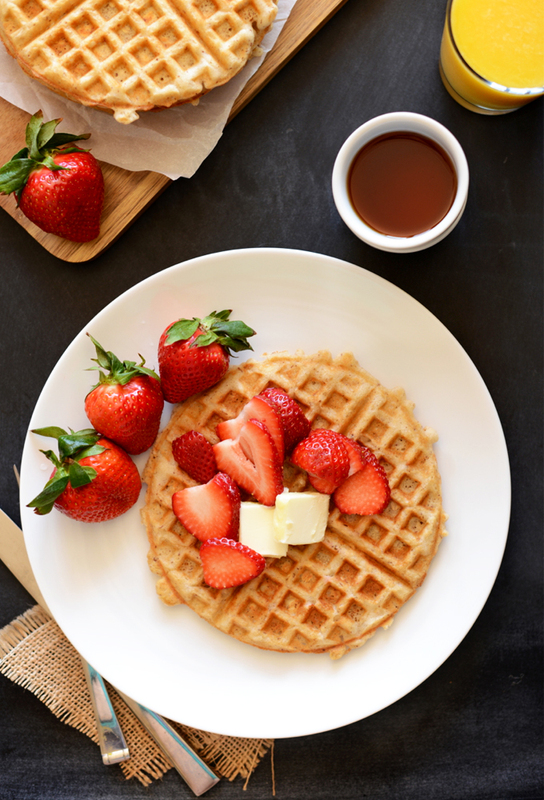 It isn’t brunch without waffles. Don’t ask questions. Look at that stack of glory! The recipe is simple, as always: One bowl and under 30 minutes. It does include a few gluten free flours but I found mine easily and affordably at a local market and can almost guarantee you can, too. If you’re a GF eater, you likely already have these on hand. And if not, just sub in the same amount of all-purpose or whole wheat flour for a similar result (although some modifications may have to be made for consistency sake). What do they taste like? Awesome in the mouth. Tender on the inside, crispy on the outside, and lightly sweet with a hint of vanilla. 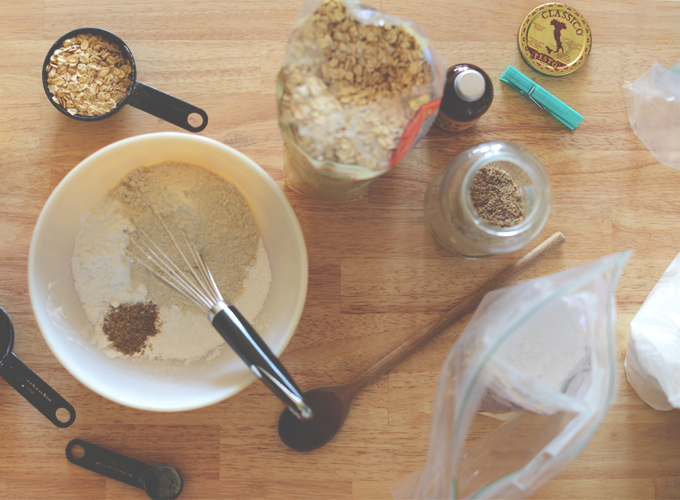 Plus, they have plenty of good-for-you ingredients like flaxseed, rolled oats and agave nectar. They were delicious right off the waffle press, and almost more delicious frozen and re-heated the next day in the toaster. The perfect kind of waffle, if you ask me. Let’s be real, it isn’t a waffle without toppings. I went with a little vegan butter, strawberries, banana, and maple syrup. But these would also be excellent plain, with a few chocolate chips, or with peanut or almond butter. 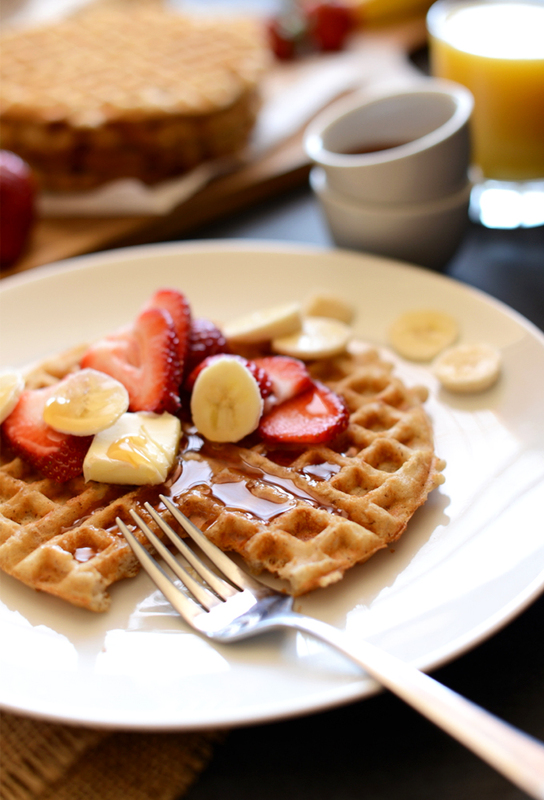 Long live the brunch waffle! A crispy-on-the-outside, tender-on-the-inside, vegan + gluten-free waffle that's lightly sweet and incredibly satisfying. Healthy enough for a weekday breakfast and special enough for a weekend brunch. Combine almond milk and vinegar in a large liquid measuring cup and let set for a few minutes to curdle/activate. Then add melted butter, vanilla extract and agave nectar and whisk. Set aside. Once waffle iron is ready, generously coat with non-stick spray or vegan butter and pour on about 1/3 cup of batter. Cook according to manufacturer instructions and then remove and place on a baking rack in a 200-degree F (93 C) oven to keep warm. Do not stack and instead keep them in a single layer to ensure crispiness remains. Serve immediately with desired toppings. Store leftovers in a freezer safe bag and reheat in the toaster for best results. Will keep in the freezer for up to a couple months, although they're freshest within the first couple weeks. I made these for Thanksgiving breakfast. Could not peel them out of waffle maker. I tried more oil, thinning batter. Nothing worked. They separated, stuck on the top and bottom of waffle maker. It took me a long time to pry them off of the waffle maker to clean. So strange. Sorry you had that experience, Janet. Thinning the batter actually won’t help with a sticking issue – that will make it worse. I’d say it’s either an issue of a batter that’s too thin, or too little oil on the waffle iron. The batter thickens up while I am cooking the waffles, I have added more Almond milk to the batter but then the waffles aren’t as stiff add taste different. Any suggestions or tips? I made these today. Total yum! I didn’t have rolled oats so I used quick oats. Used maple syrup in the wet ingredients and 1 TBS honey in the dry. I also added cinnamon. The last two of the batch, I added blueberries. Delish! Yay! Thanks for sharing your changes, Brenda! Glad you loved them! I just made these and they are delicious!!! I have been trying for years to make a gluten free/vegan waffles and every other recipe was en epic fail! I only had a Belgian waffle iron and so the batter made one batch of four nice thick waffles. Crispy on the outside and soft inside. Thank you thank you!!! Can I use arrowroot instead of tapioca flour? I subbed soy milk for almond milk, and didn’t use tapioca flour and potato starch because I didn’t have them, just used whatever flour I had the two times I made them. They came out perfect and delicious by themselves, I couldn’t stop eating them! Thank you Dana! I thank God for your website! I’ve tried this several times and the waffles come out tough, and mean really tough. Does anyone have any tips that I could try to make them crispy but tender? Hi, do you think cashew milk or coconut milk would sub for the almond milk ok? thanks! Hi! Cashew milk is going to have a similar flavor to almond milk so I’d go with that! Both should work though! If you try them out, let me know how it goes! I made crepes out of it and it was very good! I used rice flakes instead of oats and this worked very fine. Hello! 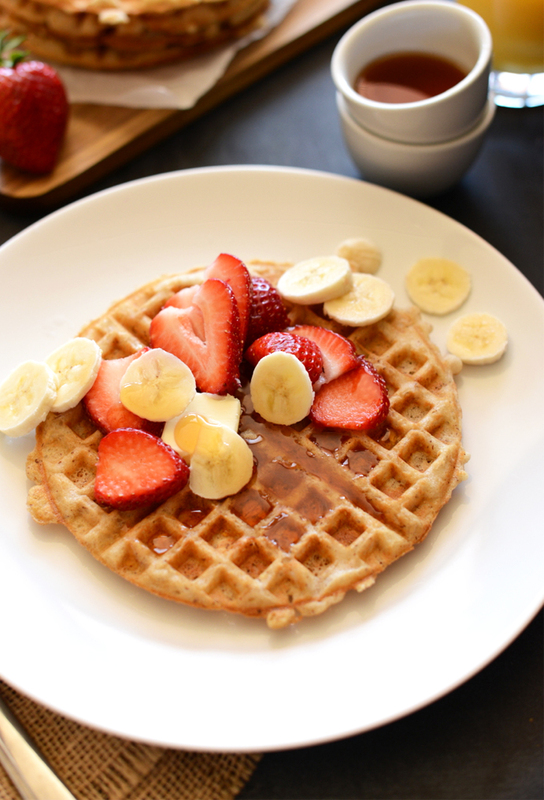 I have used your oat waffle recipe several times and both my husband And I find the flavor delicious. The recipe is slightly different from the above though. The one imprinted out called for 1 3/4 cups gluten free flour blend whereas the above does not use a mixture, but rather separate flours. Also the above recipe calls for flax seed and sugar. Regardless, my recipe comes from your blog and is perhaps an update? My question though, is that I cannot get the dough to fully cook in the center of the waffles, the outside is crispy and delicious, the inner part seems uncooked. What can I do to have the center be, well, not so gloppy? The flavor is so good that I really would like to perfect the method. Delicious! Was running low on vanilla extract and added some almond extract – perfection!! My waffles came out thick. The batter was thick as well. I used a Gluten free mix by Cafe. I added 1 tablespoon of chia seeds, hemp seeds, and flax seeds as well. After the first waffles I added almond milk which helped a little. They tasted great still! Why thick? The chia seeds thicken the batter. Next time, scale back on chia seeds and add a bit more almond milk if needed! :( These stuck like crazy! We have a very good non-stick professional waffle maker..and I greased it up with vegan butter…and I still only managed to get ONE waffle that didn’t stick. :( It was DELICIOUS….any tips for better success? Hmm, I haven’t heard this before? I’d recommend trying nonstick spray next time because it gets in all the grooves. I tried these the other day. They sticked to my waffle iron like crazy. I couldnt get them off, even worse i destroyed the non-stick coating of my waffle iron completely as i was trying to get the waffle off. I have to buy a new waffle iron now. I made these this morning and was blown away! I am not gluten-free, but have been trying to make more gluten-free things because I suspect my husband has a sensitivity to it. I’ve had mixed results so far, but these were completely awesome. I have to wonder about the people who said the batter was too thick? My batter was very runny and I followed the recipe exactly. These were perfect and I think I prefer them to my regular recipe! So thanks! Wow! These turned out great! I substituted coconut milk (drinkable) because I’m allergic to almonds and wanted something with the same viscosity. I also added 1/2 cup finely chopped pecans. Heaven in a waffle! Can’t wait to share these with my son who’s also GF and allergic to eggs. Finally, a real waffle!!! Thanks! 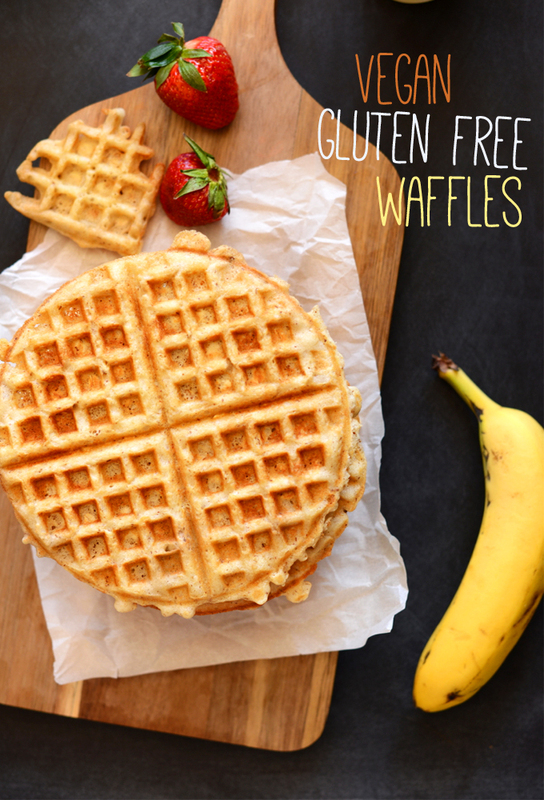 Why is it that every gluten free vegan waffle I make sticks to my waffle iron (including yours)? Am I doing something wrong? It seems the more oil I use the wore the problem gets. I have used 3 different waffle irons and always the same result. Before I found out about all our food alleries, I made waffles every weekend. I am soooo frustrated! Hi. This was my first time in life trying a waffle…..so easy. They were quite tasty but I have a couple of questions. 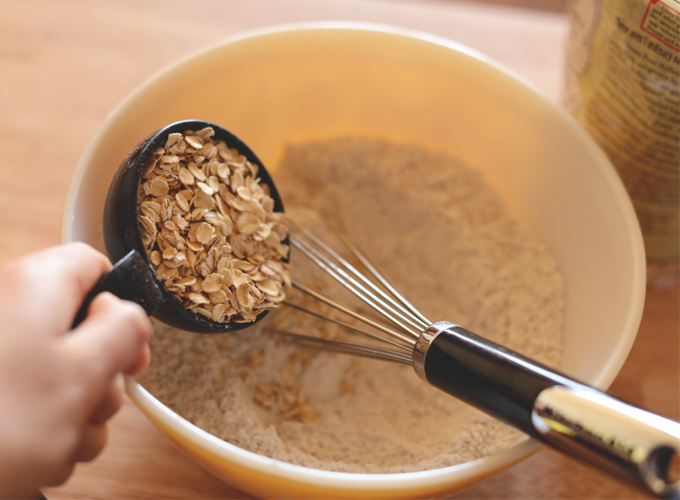 First, are you using quick cooking or regular oats? And second, is the batter supposed to so thick? It could hardly spread on the iron but it did cook. Like another reviewer I thinned the batter after the 1st couple waffles and that caused them to stick more. Thanks for a super simple recipe. I’m sure you could, but I can’t guarantee the result because I haven’t tried it! But if you do, be sure to report back with the results! That’d be super helpful to other readers (and me!). I do not leave comments too often but had to for this recipe. These are amazing. My 2 year old, 5 year old, husband and I all loved them. There was nothing left! I forgot to add the syrup or agave and we thought they were perfect, so I will probably leave that out again. Best waffles ever. We are just starting down the gluten free path and this gives me hope! Ah, thanks Michelle! Both for commenting and being so kind to share your experience! So glad you enjoyed these. Cheers! I had to stop by and give you your props. I am new here, & this is the second recipe I’ve tried from your site in the past two days and they are both 5/5 star recipes! All I want to know is WHEN is your book coming out?! Thank you so much! You guys are the bomb. Yay! This makes me so happy, Rachel. Glad you enjoy our recipes. We are currently putting the finishing touches on our cookbook and it will be out at the end of January/beginning of February. Can’t wait to see what you think! I made these for breakfast this morning. They turned out perfect! I was shocked at how wonderfully crunchy they were on the outside. There is nothing worse than I waffle that is basically a pancake… This made the perfect amount for my husband, my daughter, and myself too. Loved them. Thank you for this recipe! I made these this morning and they turned out great. I did not have any tapioca flour on hand, so just substituted it with more potato starch, and that worked fine. I did think they were a bit too sweet, so I will leave out the white sugar next time, and will increase the salt a bit to a scant 1/2 tsp. Again, thanks a bunch! Yay! Glad you liked, Shelbey! With many modififications this could be a good recipe. The dough is more like biscuit dough and makes a gummy waffle. Sorry. Experienced vegan chef and was really disappointed. Can not wait to make these for my little one who is wheat, egg and dairy free. Hard to find gluten free and egg free recipes that are not super involved to make. Thank you so much for taking the time to work the recipe! These are SO DELICIOUS. My boyfriend recently has been transitioning into GF, and feels a lot better as a result, and he whipped up this batch the other day and I came home from class to these delicious waffles. So good smothered with Earth Balance and some real maple syrup. They were so good I couldn’t resist making them again today. The thing about these waffles too is that they are pretty filling, so we could each only eat about 2 max (maybe 3). Great recipe though, will definitely make them time and time again! Thanks Minimalist Baker! Monika! Thanks for sharing your success with us. We created this recipe with a few of our own gluten free friends in mind and were thrilled when they loved the result. Thanks again for sharing! Hope you and your boyfriend make and eat many many more of these waffles :D Love hearing from readers! Eating them right now with almond butter and a drizzle of agave. I too added a tsp of cinnamon. Decadent. I intend to make them for the non-vegan, glutinous members of the family. Hmm, now I’m thinking about a savory version for a future dinner,… Thanks for sharing! 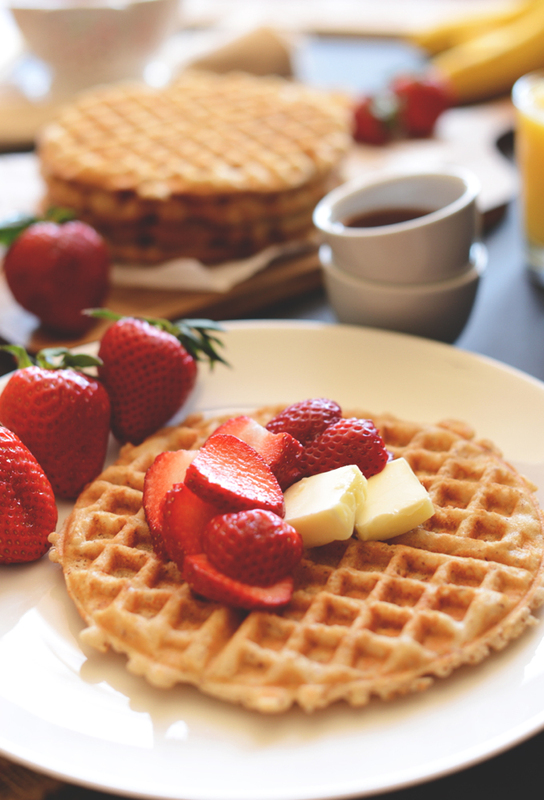 Terrific, yummy , waffles . Great photos too ,very appealing . Thanks . These are so good I replaced potato starch with arrowroot starch and replaced the tapioca flour with shredded unsweetened coconut I also added vegan chocolate chips to half te batch. I’m in love!!!!! Hi, I really like the sound of this recipe! And the comments vouch for it, as well, but I am wondering about the fact that that the oats are uncooked/not ground into a flour. They are just mixed in with the dry ingredients. Do you notice biting into uncooked oats? That seems unappetizing in a waffle.. I appreciate your feedback. Thanks!! Nope! They taste great and are hardly detectable. Not chewy or piecy at all. Hope that helps! I just made these and they were very yummy! I had to make quite a few substitutions as there were some things I did not have. I replaced the 1/2c of potato starch with tapioca starch, used coconut oil instead of vegan butter, used 1/2c of soaked, dehydrated & blended oats, used homemade oat milk instead of almond milk and instead of adding maple syrup, I used 2T of coconut sugar. The mixture was very thick, but it made lovely waffles! After the 2nd waffle I added more water to thin the mixture out, just to see what they would turn out like, and this made them very crispy and delicious! (they did stick a lot more, but I could still remove them from the waffle maker whole). Definitely the best recipe I have found so far, and I have tried A LOT of gluten free/vegan pancake/waffle recipes, most of which turned out mushy and inedible. Thanks heaps! I have two problems with these waffles. Well maybe three. The first is that they were so good I never got to eat any from our first batch. They literally flew off the table. Second they stick to my waffle iron like no tomorrow. I have cooked so many waffles and have never had an issue even without greasing the griddle but these are sticky! Even though they stick it is worth every poke and prod and imperfect waffle on the plate. The kids dont care so why should I? The third problem is there can never be enough of these. They are absolutely amazing. We have been gluten free a long time and I thought I had waffles down but this recipe put all my others to shame. Many other gf waffle recipes come out chewy or semi mush with absolutely no flavor but this, oh, this was heaven! This is definitely the recipe you want to at least double when you make it! I am new to gluten free cooking. Is there a substitute for potato starch? Oh mon dieu! Those look amazing! Thank you for this recipe. This recipe is soo wonderful and easy! I wouldn’t have known they were gluten free if I hadn’t made them myself. These waffles are soft and chewy. From now on this will be my go to waffle recipe. These are so good! Thanks for giving us the best recipe for GF waffles EVER! I omitted the sugar at the end, and they were perfect! Love that they freeze well too. Beth, so glad you enjoyed these! I stil have one or two in my freezer and can’t wait to eat them all up this week! Such a quick and easy (healthy) breakfast. I love this recipe and of course they’re the best when they’re just made. 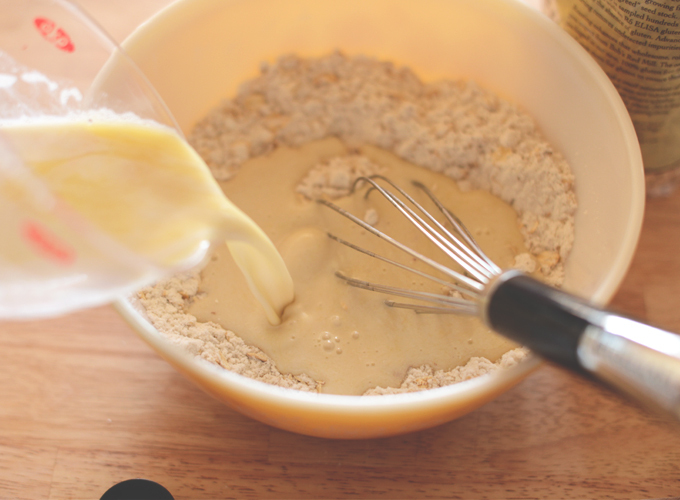 Do you know if you can keep the batter in the fridge for a couple of days without any problem? Thanks a bunch! I’m sure you could but there’s no guarantees as I haven’t tried it. But maybe one day in advance at most would be best. Hope that helps! I have got to try this! I will have to sub out quinoa flakes for the oatmeal (we cant do oats around here) but this seems perfect. 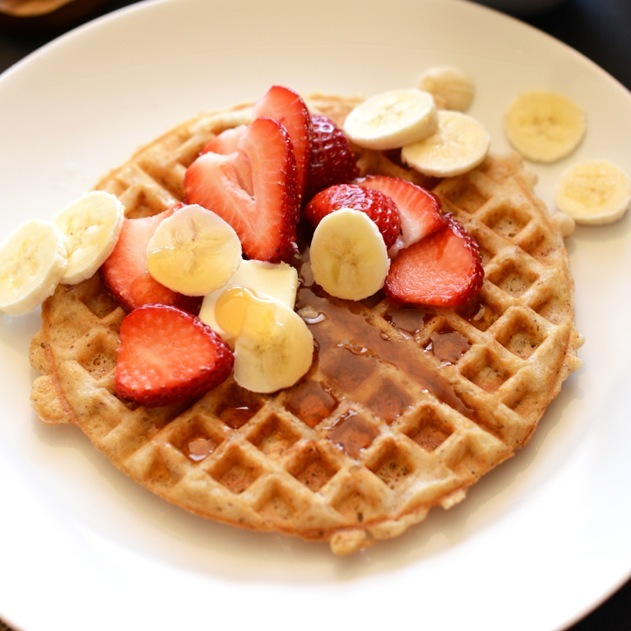 I have been wanting a gluten free vegan waffle recipe soooo bad. Vans makes me sick (all the sugar!) and all the ones I have adopted havent turned out amazing. just made these….oh wow. they are seriously the best waffles I have ever had (and Ive tried TONS of recipes trying to perfect vegan waffle making). The only subs I made was I omitted the dry sugar at the end, and added a dash of cinnamon. Thank you! Beautifully photographed! Now I want a waffle maker. Until I get one, I’ll try making them as pancakes. Yum! Hi! Could I use arrowroot instead of potato starch? Oh my! These might be the final push that I need to get a waffle iron. They look so good. My favorite gluten-free pancakes are vegan too. And you’re right, as a regular gf baker, I totally have all of these ingredients on hand. 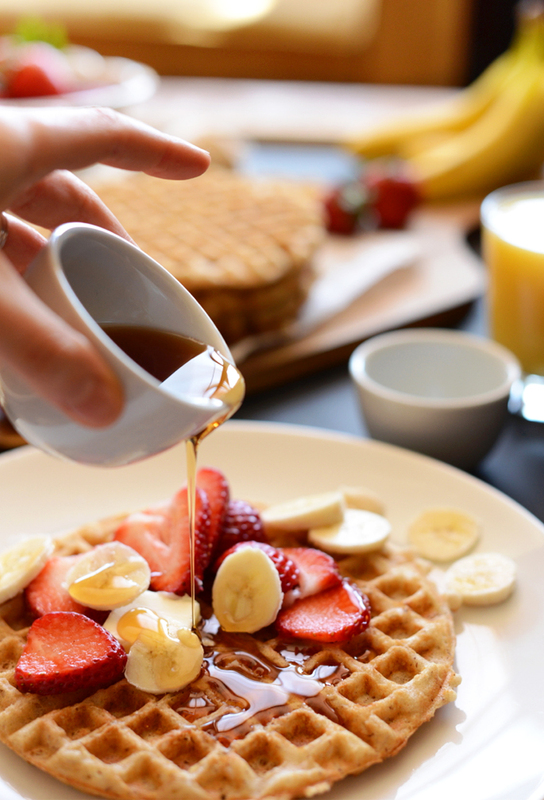 Long live the brunch waffle! My home is tear-inducingly waffle-iron-less at the moment. I will keep searching on, though! Never give up! Thank you so much for this recipe! These were so great. Couldn’t stop eating them. I’m vegan and my husband is vegetarian and gluten free, so these were perfect! These really do sound like everything good in waffle form. How beautiful are these! I totally need to steel back my waffle maker from my parent’s house so I can get on this ASAP. YUMMMMM! These looks SO good!! I wish I had a waffle maker! I might just have to run to target tonight! These look yummy and we are trying after Passover for sure! I try to keep our food real. Have to tried coconut manna or oil for these in place of vegan margarine? I use coconut oil a lot in baking, actually. However, for these I was looking for that buttery flavor. I’m sure coconut oil would be great as a substitute though! 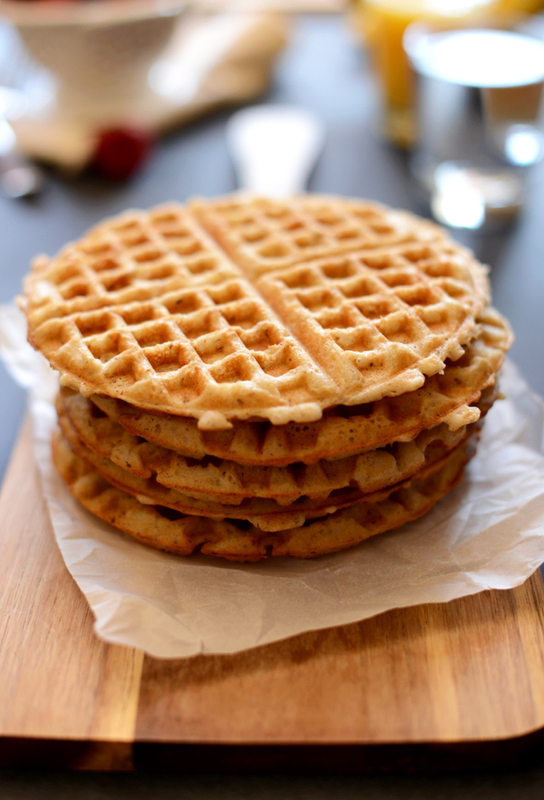 I have a belgium waffle maker and I maybe one of the few people alive who wants want to make thinner ones like these! Mind sharing what waffle maker you use? I am on the hunt. I just have this Cuisinart one – very affordable and reliable. That’s actually the one I have been looking at so I’m glad to see this is how they turn out. Thanks so much! looking forward to trying these. Me wanty waffle maker! I don’t have one, and evidently, I NEED to get one ASAP so I can make these!!! Yum! I love waffles. What kind of person hates waffles?? Your husband is crazy! haha, we certainly have different taste in breakfast. But he liked these!